Our screen shots are pictures that we have taken and forgotten over the years. Although we have selected random occurrence they seem to come in spurts. Not long ago we ran across a series of shots that must have been on Sally's phone because I don't recall taking them. Obviously I didn't take this one. When I found them we had just given Cruz and his Mother (Red) to a nice family a few miles away. 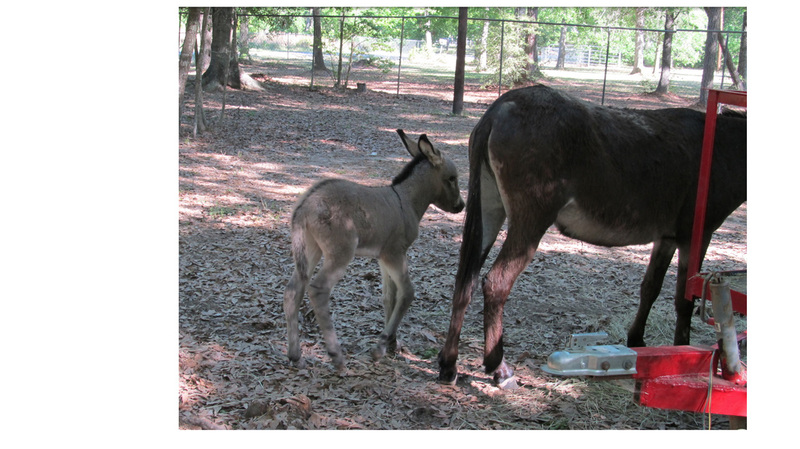 They are both pretty large donkeys so it's funny to see him so small. The picture above and the one to the right are both 3 generation pictures, I believe. 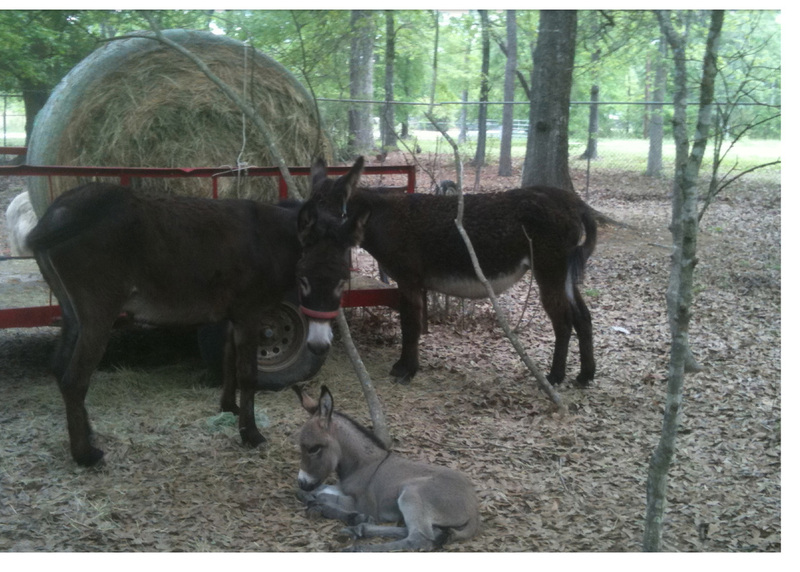 The lady with the red halter is is mother Red. I think, but cannot be sure, that the lady with the blue halter is his grandmother, Blue. You couldn't peel him away from his mom for about a month. Then you couldn't find him with her except at mealtime. 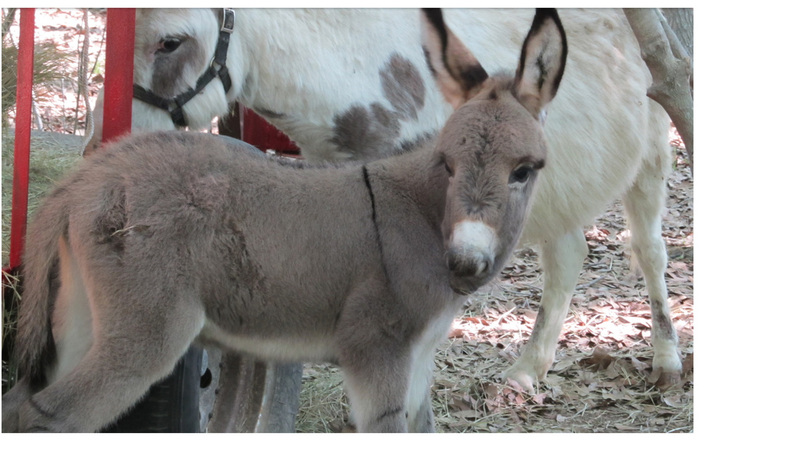 Of the three baby donkeys that were born here, he was the one that was always running. He was also the most independent which is why he was given away. He and his mother had the same personality and that personality was aggressive to dogs, foxes, and the like. He is the future (perhaps present) guard of a few acres in Magnolia, Tx. I kept Elvis and Princess (the twins born 13 months apart) and nobody seems to have separation anxiety. 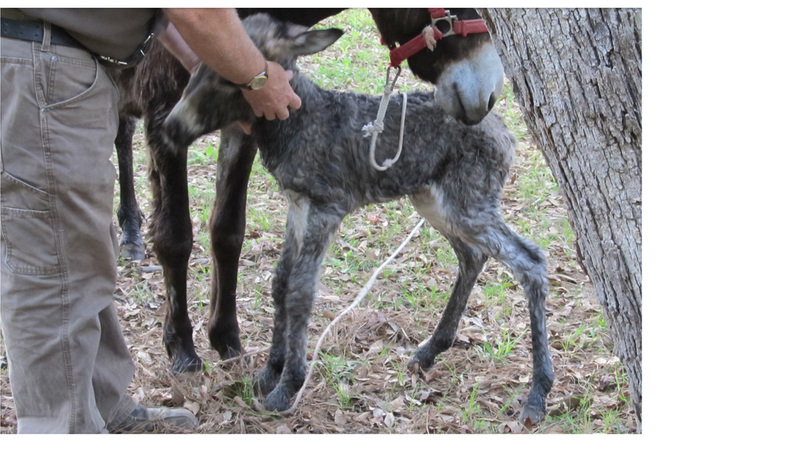 Even as a newborn he had the most pronounced cross on his back of any of our donkeys. Thus the name Cruz...spanish for cross. There were never any complaints about the food. We were lucky to have a natural babysitter here. When the colts were old enough to start wanting to be independent, there was feathers. We got feathers for my granddaughter for her birthday. I think she was turning maybe 14. It didn't take long before the new wore off and Nanny and Papa inherited the donkey. Next week she is getting married and if I could have found a buyer for feathers I would have given her the money. No buyers and we still have three donkeys. That's not a bad number. Anyway, I intend to send this link to the current owner of red and cruz. A story that is far more complete about all our 4 legged critters (except the dogs): How the herd does grow.